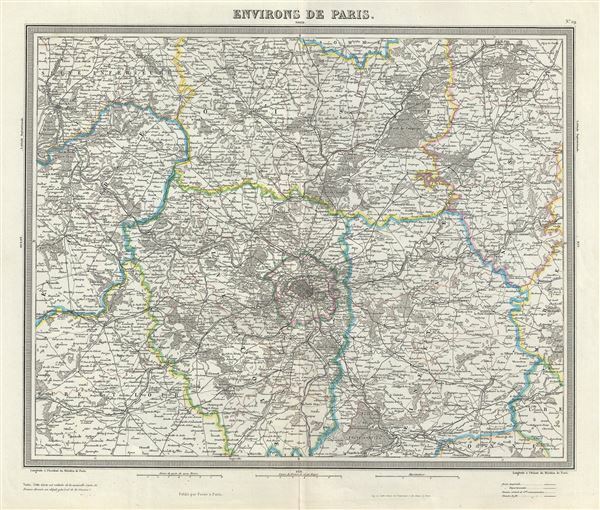 This is a scarce and beautiful 1874 map of Paris and Environs by Ambroise Tardieu. It covers the Seine valley in a roughly 50 mile radius of Paris. Chartres appears in the extreme southwest and Laon in the extreme northeast. It offers extraordinary detail throughout showing forests, fields, roads, cities, farms, rivers, trains, and topographical features. This map was prepared by Ambroise Tardieu and issued as plate no. 29 in his 1874 edition of Atlas Universel de Geographie Ancienne et Moderne.